“What a fellowship, what a joy divine, leaning on the everlasting arms. What a blessedness, what a peace is mine, leaning on the everlasting arms.” Neighbor, what would we do without Jesus? He is our hope and stay; He has never failed us yet and He never will fail us! He is our guide. Oh! how we need a guide. We arrive at the place in our spiritual life where we truly say, “Not my will, but Thine be done!” Now, the problem is which way to go, what to do, and how to do it. Our comfort is that our God is our guide forever and ever, even unto death. He will speak to our hearts as we seek Him. His spirit will bear witness to our spirit that, “this is the way, walk ye in it!” He will open and close the doors and He will rule and overrule. We praise Him for His hand upon us and the work of First Nation Ministries continues to prosper and grow. As of June 5th, we have made 54 trips, making 73 visits. On 13 of the trips we used the 99 Western Star truck and its 48 foot semi-trailer! I am amazed at how God is putting all the pieces in place. Let us join our hearts and voices in thanksgiving and praise. To God be the glory! As I approach my 87th birthday on September 2nd, I smile at a little poem someone handed me. May I share a line or two of it with you? My hair, you’ll see, in now gray and much of it has gone away. My hearing aid is wearing out, I only answer if you shout. Yes, the outward man will perish, but blessed be the name of Jesus, the inward man is renewed day by day. I praise God that I know that I am doing what He has called me to do. He has opened the doors and I purpose to walk through them as He leads. I know that I am not alone for He holds me with His almighty hand and has given me an army of the finest teammates to do all that He has asked me to do. The battle is the Lords and victory is ours through Him. Neighbor, my bags are packed! I’m ready for the final move at any moment, night or day. But, until God calls me home, I purpose to give Him my best to reach the reservation Indians for Christ. I have joy in working everyday He gives me and I thank you for helping make it all possible. God bless you teammate! In the days following World War II, when Communists were overrunning China, the endangered missionaries found comfort knowing that in a world dominated by the “Iron Curtain” and the “Bamboo Curtain” they could rest under the “Feather Curtain” of God. Still I can trust Him I know He will keep me, He has redeemed me and I am His child. Under His wings, O what precious enjoyment! There will I hide ‘til life’s trials are o’er. Sheltered, protected, no evil can harm me, resting in Jesus I’m safe evermore. Under His wings, Under His wings, who from His love can sever? On April 13th, the Big Rig was fully loaded and headed out for the reservations of South Dakota. Once again Les and Shirley were taking it to the land of their youth. The prayer band prayed in faith believing for their safety and success. 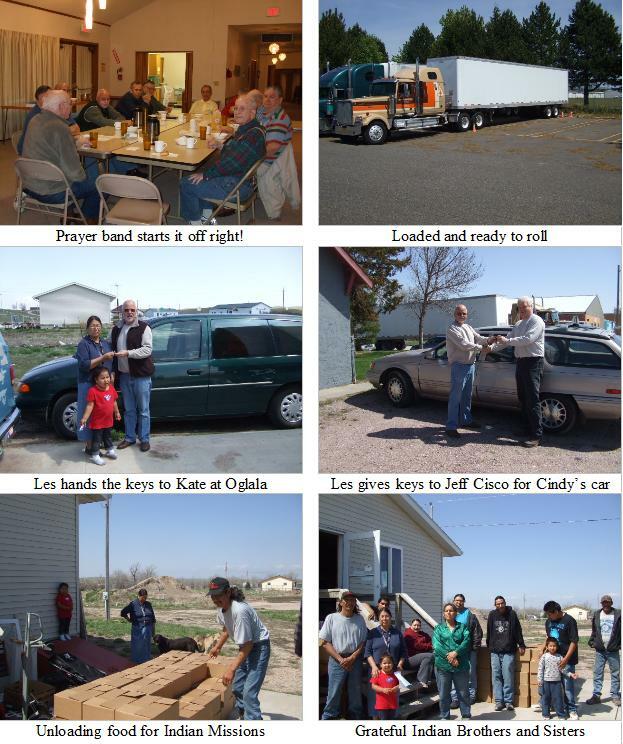 At Oglala (#68) they visited Kate Kindle and gave her the keys and title to the “like new” 1998 Ford Windstar that God had provided for her. Now she will be equipped better than ever to carry the food and God’s word in her house-to-house ministry. The weather was rain, rain, and more rain which made the mud roads impassable for the Big Rig, so Les called Cindy Antelope at Potato Creek (#69) and Cecelia Spotted Bear at Wounded Knee (#70). They were pleased to have Rev. Jeff Cisco take their supply and the very nice 1994 Ford Taurus for Cindy until they could pick them up when the weather cleared. Bro. 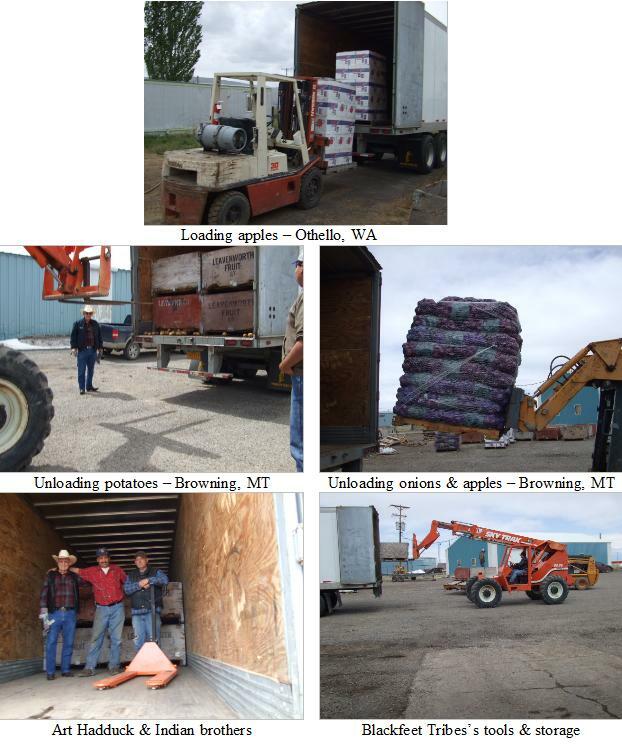 Don Butcher, from his Thirsty Acres growing operation and his Agape Food Bank ministry at Othello, WA, wanted to again help us with a truckload of apples, onions and potatoes. His helper, Earl Lee, handled the details and all I needed was a driver. Our longtime friend, Art Hadduck, saw our Big Rig parked at Troutdale and rejoiced to hear that we were back in the Big Rig ministry to Indians, offered to help. In a matter of hours, he took the wheel and I rode “shotgun” to the Blackfeet Reservation at Browning MT. Years ago, Bro. Don had given us a number of loads which we delivered as far away as Anchorage, AK. What a blessing and joy to minister again to the several missions at Browning in this wonderful way. Praise God! Friday morning, May 15th, was a beautiful day and what a blessing for Jeff Phipps and old Bro. Don to join the prayer band in a time of intercession and praise. God was there! We felt His presence as we climbed into the Dodge Diesel with its fully loaded 14-foot van trailer and headed into the rising sun. 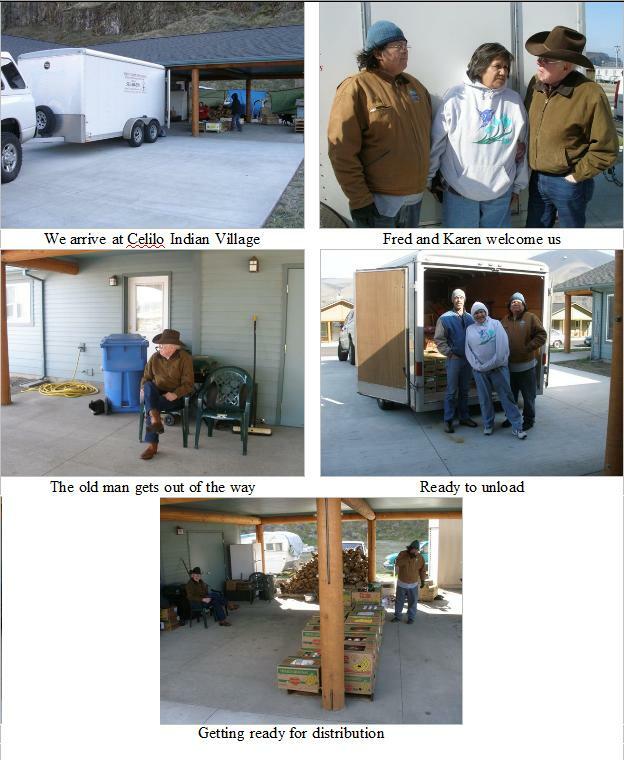 We arrived at Celilo Indian Village at 10:00 AM to find Fred and Karen Whitford, our point people, bright and smiling with their warm welcome and appreciation. They have been not only ministers to their own village, but reaching out to a similar village about 20 miles away on the Washington side of the river. Let us pray as God opens the doors to them and us as His witnesses at Georgeville, Washington. Friday, June 5th, we once again were blessed to spend an hour with the prayer band before leaving on a mission visit. Neighbor, we one and all are convinced that prayer is the power that moves the hand of God. We each one believe fully that the blessing and success of First Nation Ministries is by God’s hand upon it! Leon Hansen and Bob King, two of God’s “businessmen with a mission call” upon their hearts joined this old preacher for another trip to the Indian School at Alberton, Montana. Summer vacation left just a few people on campus, but willing, anxious hands took to the task and quickly unloaded the trailer and put us up for night. We thank God for the good traveling weather, safety, and blessing on our travel.